The Mahogany & Maple Cabinet was commissioned for a client who practices meditation and yoga and wanted a small cabinet that when he was seated would be at eye level. The inside of the cabinet is used for housing all of his books and pamphlets. 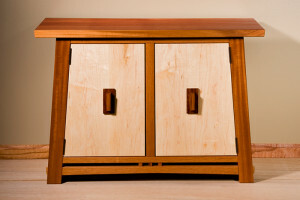 This entry was posted in New WoodWorks! on July 10, 2014 by billfirst. All images and material ©2019 Bill First WoodWorks.